JNN 28 Dec 2013 Beirut : A large explosion has shaken the downtown area of the Lebanese capital, killing former government minister Mohammed Shattah. Lebanese television showed footage of dead bodies lying near the wreckage. At least 5 people were killed in the explosion that went off just a few hundred meters from the parliament building and other official government headquarters, said Reuters, citing security sources. Mohammed Shattah had previously been advisor to former Prime Ministers Fuad Siniora and Saad Hariri and had also served as Lebanon’s envoy to Washington. Former Prime Minister Hariri laid the blame for the attack at the feet of Hezbollah following the attack. Shattah had reportedly been on his way to a meeting which was expected to take place at former Prime Minister Saad Hariri’s residence.in connection of the March 14 Alliance due to be held at the Center House in the downtown area, when his convoy was hit by the blast. The Alliance is made up of representatives from political parties and individuals who are against the current regime in neighboring Syria. The on-going violence in Syria has spilled over the border into neighboring Lebanon on a number of occasions, where the population is divided over its support of embattled President Bashar Assad. Mohammed Shattah was an outspoken critic of Bashar Assad and had openly voiced his opposition to the influence of Hezbollah in Lebanon. 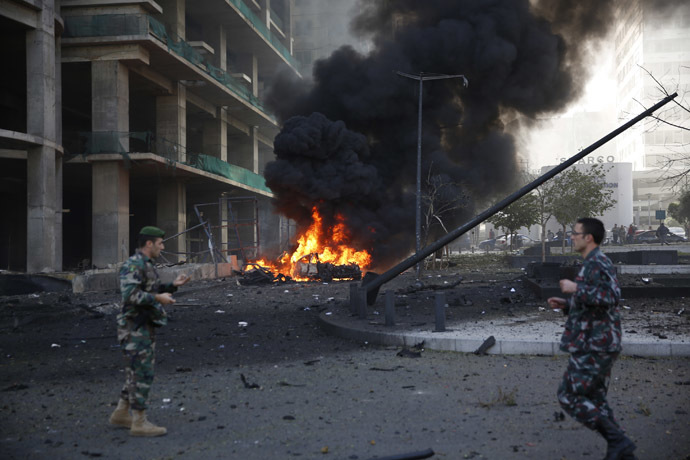 On November 19, around 25 people were killed in a double bomb attack outside the Iranian embassy in Beirut. Hezbollah resistance group has strongly condemned the Friday morning assassination of former treasury minister, Mohammad Chatah, saying that such heinous crime mainly aimed at targeting the stability of Lebanon. The enemies of Lebanon benefit from Chatah’s murder, and that this crime is part of a series of crimes and bombings meant to destroy Lebanon, the party said in a statement released by Hezbollah Media Relations. The statement added that the attack is a “flagrant attempt to target the national stability and unity,” noting that no one profits from such blast but enemies of Lebanon. “Hezbollah calls on all Lebanese to be rational and wise in order to face the dangers which are threatening their country,” the statement noted. The party also urged the security and judicial apparatuses to exert efforts in order to arrest the perpetrators and bring them to justice. This entry was posted in Lebonan, Middle East and tagged Bashar al-Assad, BEIRUT, Hezbollah, Lebanese Broadcasting Corporation, Lebanon, Mohamad Chatah, Mohammed Shattah, Prime Minister Saad Hariri, Saad Hariri, Syria. Bookmark the permalink.